4x10 Wicker Oil Rubbed Bronze Floor Register Discounts Apply ! 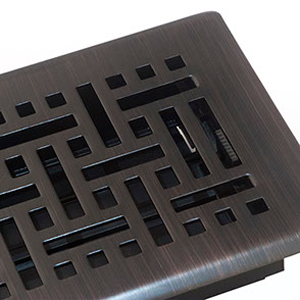 Decorative floor vents are plated with an oil rubbed bronze finish and will add style to any space. This 4 x 10 floor register is coated in a protective lacquer which prevents them from discoloring. Installation for our decorative floor vents is a breeze because they just drop into your floor hole opening. 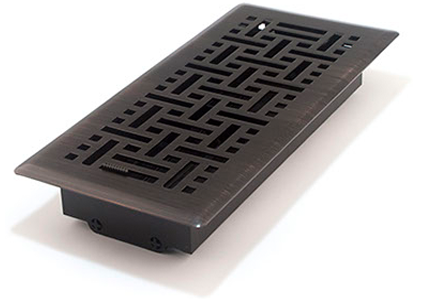 Unlike other 4 x 10 floor register, our decorative floor vents have a plastic damper that is rust proof. These 4 x 10 floor registers can hold up to 200 pounds of weight because they are crafted with a steel core construction. ***Hint: When ordering the correct 4 x 10 floor register, industry standards ask that you measure using the actual hole opening dimensions and not your existing register's faceplate dimension. These decorative floor vents will fit a 4 x 10 inch hole opening. Our wicker 4 x 10 floor registers come in a selection of sizes and also a number of finishes. Purchase these decorative floor vents today and restore your decor!